Texas 1/2 Marathon, I’ve run Faster as a Gorrilla! I drove down to Texas with a couple of friends back on February 6th and did the Texas Half Marathon. I actually thought I had a chance of running a PR, instead I ran my slowest 1/2 marathon since 2001 when I started running. 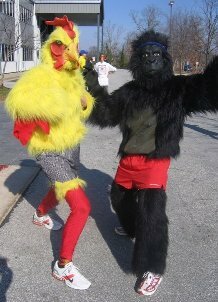 I even ran slower than I did when I dressed up in a gorilla suit for a 4 mile race! Don’t get me wrong, I’m glad that I even have the opportunity to run and I fully understand and appreciate that many people would be happy with the time I ran. The bottom line is I’m not happy with it and it is up to me to quit monkeying around and run better next time! Well, here I am a little more than a year later not having met any of those goals! I tried pretty hard at the beginning of 2008′ to break my PR in both the 1/2 and full marathon but wasn’t the wisest in how I went about it. For the 1/2 marathon attempt I gave it a go in the Sedalia Half Marathon with a 1:25:24 and then tried to break my marathon PR a week later, giving my self another sub par performance with a 3:08:11. Had I instead chosen to race one race, and made it be a flatter 1/2 marathon with a larger more competitive field I probably would have improved my 1/2 PR. Shortly after my Olathe Marathon experience I got the urge to buy a house instead of renewing my lease that was up for renewal. Since I’m cheap and am not scared to try my hand at just about any handyman project, I found myself closing on a $20,000 fixer upper at the beginning of May. I also happened to start dating someone in May so between the new fixer upper and a female, training time quickly vanished along with most of my early pre-season fitness gains. After peaking fitness wise for the year in early May, I continued to race and try to juggle time between the house, training, and my girlfriend. Somehow I still managed to race 29 times and ended the year with a total of six wins, a second overall place in the Ultramax Championship series, as well as first overall in the St. Louis Triathlon Club series.